Anyone brave enough to try the garden fence? . . . .
Our deerly friends abound after a dry spring with little rain. They gaze down on the green expanse of lawn, shrubs and garden with great interest, and we are thankful for the new fence that keeps them at bay. We do welcome their presence–just not inside the yard! They are shedding their winter coats and look thin and scruffy, but will be sleek and fat in no time. 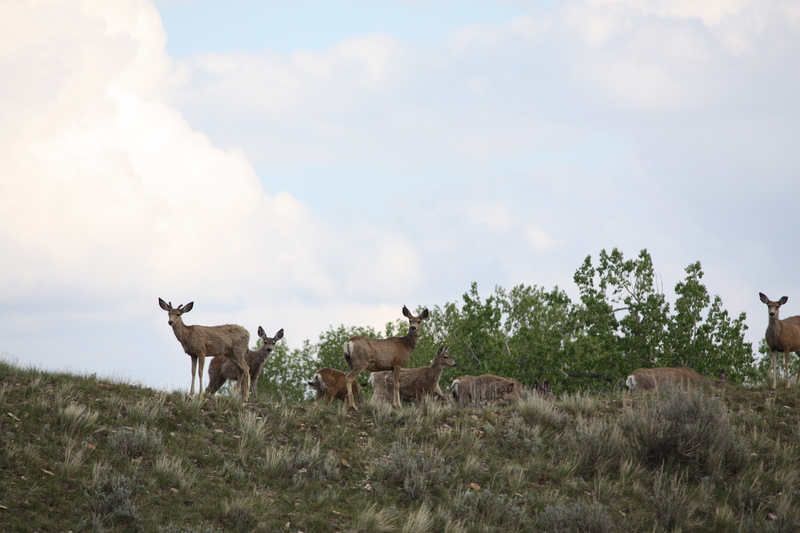 Does, or female deer, will be giving birth in June and will keep their fawns hidden from view for most of the summer. 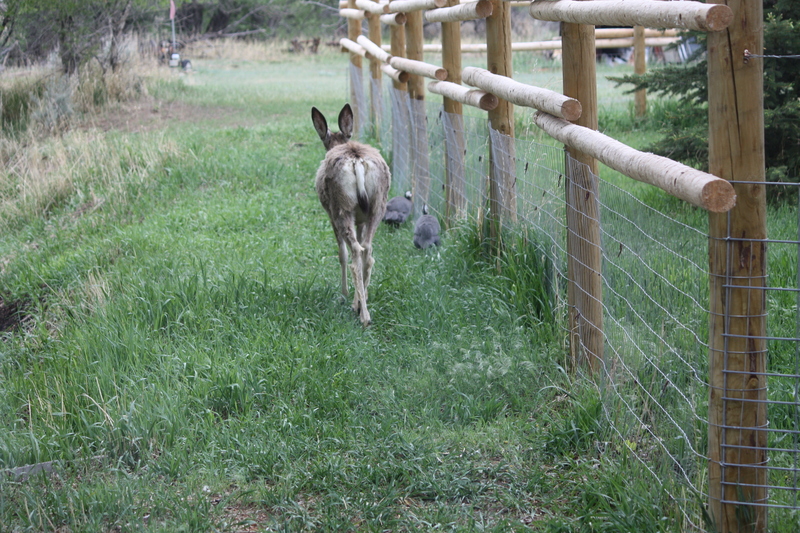 We try to walk carefully around the secluded areas they choose each summer to sequester their babies. deer herding guinea fowl who won’t get “out of my way” . . . .
A loud squawking of guinea fowl erupted outside the office window and a hilarious encounter of a young buck deer and the guineas turned into a rout. The young deer seemed curious and tried to approach the guineas by reaching his head down to examine them closer. They did not appear to like this intrusion, but held their ground and clamored for him to leave. He snorted, humped his back, jumped into the air, and shook his stubby little horns at them in a macho display that had little effect. Then, apparently disgusted and with his pride in tatters, he attempted to depart but found his path blocked by two of the guineas who simply refused to be hurried along. Guinea girls are not to be messed with! lunch among the ruins . . . . 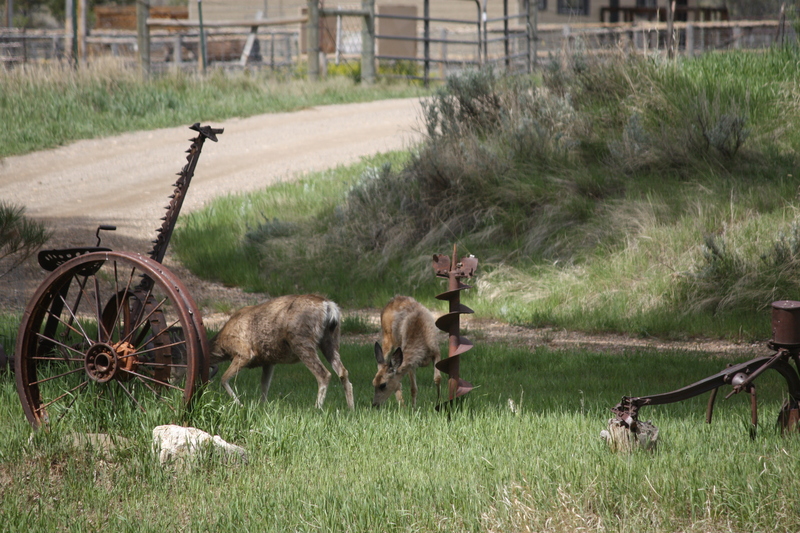 Snapping a shot of the deer grazing among the old relics was hard to resist. They pass through the area on the way to the pond for a drink of water each day, usually stopping to nibble a few leaves from the lilac or chokecherry bushes. This entry was posted in Wildlife blog and tagged nature by bygeorge. Bookmark the permalink.